where the heck was I?! 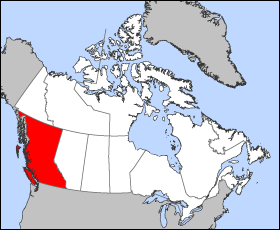 This is the province of British Columbia highlighted in red. We live on the the south-western edge in the Vancouver area - bottom left in the photo (on the mainland, not the island). 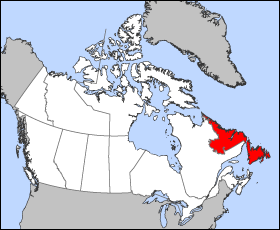 Highlighted in red in below pic is where we went - Newfoundland and Labrador, to St. John's exactly - the capital city. Yup, we pretty much went from one end of Canada to the other! St. John's is the oldest (and most easternly) city in North America. You can read more here about St. John's, and see that it is located on the very northeast point of the island of Newfoundland. Get there by plane or boat. Being so far out in the Atlantic Ocean, the weather in St. John's can vary much in one day, and the winds... oh the winds can be bitter cold. I don't care for wind, esp cold wind, so that was always a gripe of mine living there - as well as the snow and rain and drizzle. (sorry, I'm a fair weather gal!) But really, when the sun is shining, it is one beautiful place to be. St. John's brims with heritage and historical charm. You often hear how Newfoundlanders are "so friendly". Very true. "ARE YOU FREAKING KIDDING ME WITH THOSE BROWNIES????????????" Anyhow, since I had some fun times from our family reunions, here are a couple of pics. This is from my family's get together at my big sis's house. I have five sisters. Yes, six girls in our family! Growing up we had 3 to a bedroom - and ONE bathroom for us all! Lots of squabbles, squealing, scratching, pinching, fighting over clothes and you name it!! But also lots of fun times and laughter, and good memories. 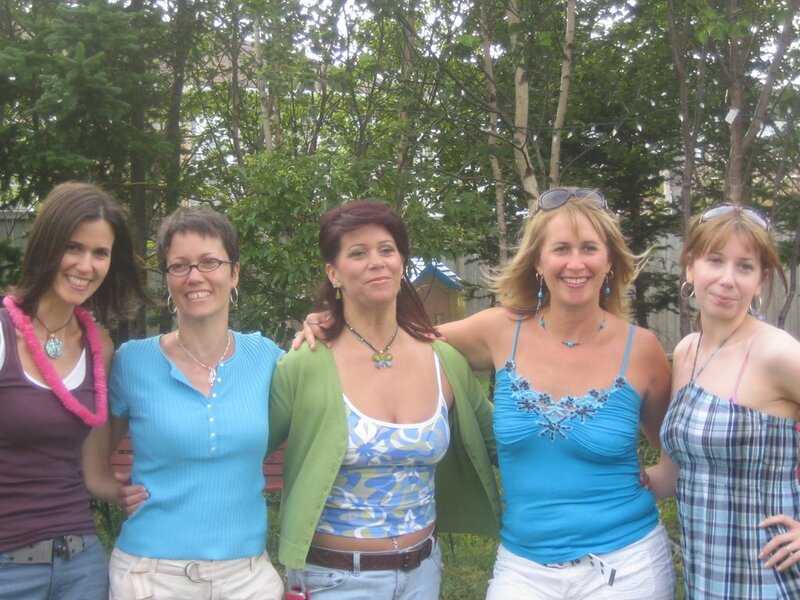 My mom is third from the left. 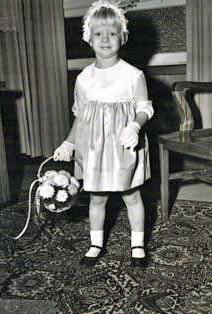 She is a very strong woman, and still so beautiful in her mid-late 60's (and after having six kids - yikes)!! I loved spending time with our family, we don't get together often. Three sisters live in Newfoundland, one lives in BC close to me (yay! ), and another lives in Nova Scotia and wasn't able to get back home this year. Kind of a bummer since we rarely get this many of us together and it would have been cool to do so this year and get some photos. 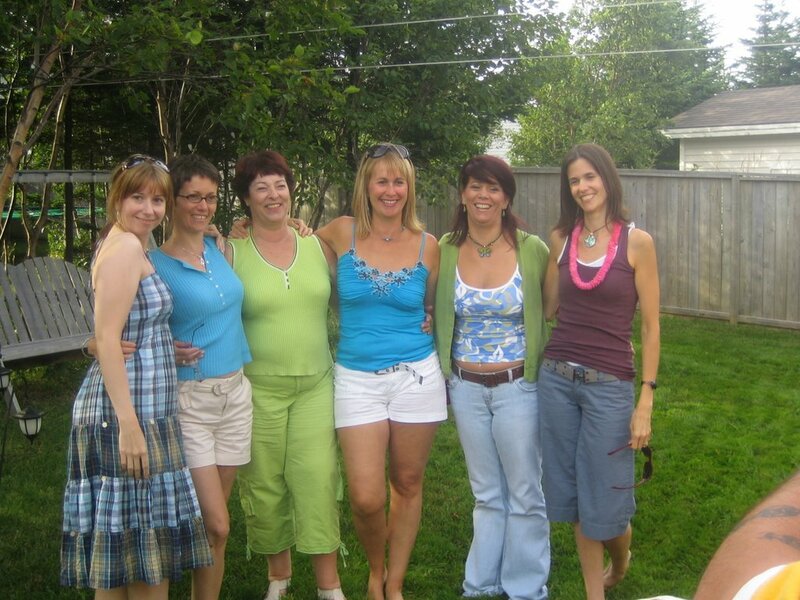 She is one of the two blondes in the family - she thought she was adopted for years until the baby sister (now grown up & on the far left) arrived with light hair!! Funny! In this pic, my youngest sis said "do the Paris Hilton pose guys" - um, she's the only one that pulled that off, the rest of us just looked lame trying to do it! Here is another of just us sisters. See this "wind-blown" effect? - Those Newfoundland winds are great for photo ops - ha! On our way back from Newfoundland, we got caught up in security with the new restrictions of no liquids on flight, etc. Now, this was a concern for me because we were going to be on the plane for 4+ hours from St. John's, and then another 5+ hours from Toronto to Vancouver. Our 21 month old drinks soy/rice milks. On the way to St. John's I had packed her sippy cups - along with a days' worth of food for us all because there is NOTHING to eat on those planes for vegans! (And what food they DO have is pure junk). FA: Can I get you something to drink? Me: Do you have any soy or rice milks? FA: No, sorry, all we have is 2% milk. FA: ((In an upbeat tone, trying to bring some humor into a long flight)) Yeah, just 2% milk. I can add some water to it and make it 1%... and then you can just sip from the top and make it skim! Me: No, we don't drink any part of the cow, thanks. Now, I appreciated his humor, and trying to keep things light with passengers. But, WHY don't they have soy milk?? In these days of dairy allergies?? Oh, they have every variety of pop and - diet pop (aka poison - pls don't drink it guys, if you still are - or eat/drink anything with aspartame) - on that flight, and also coffee, tea, juices, and yes, alcohol for $$. It seems to me that if these new restrictions are going to hold and we cannot bring on our own drinks, then they are going to have to accommodate more dietary needs. They need to offer non-dairy milks to children. I don't know what we would have done without those three soy milks for our 21 month old. She drank all of them through the flights - plus water! Maybe these restrictions will force the airlines to make changes to their snack and drink offerings with healthier and vegan choices. Let's hope! One final word to this very long post (well, it's been a while, after all)!! Thank you to all of you that e-mailed/commented through my break. I really appreciate your feedback and encouraging e-mails, and also your awesome words about my recipes. Also, I know some of you have been blogging about my recipes (and cookies! ), and I thank you - very much - for that! It is SO cool to see a fabu post about my cookies and other recipes. Thank you. I want you to know though, that if you try out some of my recipes and don't like them - that's okay. I don't expect people to love everything I have in my books. We all have different tastes/preferences, and so don't feel bad saying so on your blog if you didn't really dig something. I may resist (but it will be SO hard) commenting on all of your blogs as much as I have. Only because I want you to feel free to write about your recipe/cooking experiences, and not be concerned thinking I may read something about a recipe of mine that you didn't much like. It's okay... while I love to see the good stuff, I can also take the not-so-good stuff (alright, in small quantities I can take it... just be sure to write about the great stuff too, okay??!!! ha)! Now, didn't I mention a giveaway?? I know you are reading on looking for this... hold tight folks, just another wee bit until I get a food pic up and I'm back in my blogging groove! Stay tuned! ohh, you love just torturing us that little "just wait a little bit for the surprise giveaway.." dont you?! haha. It looks like you had an awesome time with your family! Are you the only vegan among them? Im with you on the deal with the flight foods. I guess they just try to buy the cheapest things they can buy, but I really think they'd be in better buisness if they started getting foods that met others needs. I mean, hello, Ive seen more people with food allergies now than I ever have! My aunt just found out she's lactose intolerant, after 40 plus years of living! Im glad you had a relaxing trip, now you can go back to being super-mom, super-wife, veggie-hero, and all those other things that make your life awesome(and a little hectic sometimes im sure!) We're all glad you're back! Welcome back! I'm sure it was great to spend some time with family. Dang, you're a sharp dresser! I think I need to do some shopping. Welcome back Dreena! I have certainly missed you. I go to St John's every year with my boyfriend for xmas. I love it...but I agree with you, the winds are incredible. You can experience all 4 seasons in one day. Gosh, you and all your sisters are goregous!!! Good genes going on there! hello.. i am new to the blog world but, have been cooking up a storm from vive! Love It! Love it so much I ordered Everyday Vegan last week! I can't wait. welcome back you have a lovely family.. Sounds like you had a great time with your family... Talk about the "pretty people!" It's almost time for me to move on to another Dreena Cookbook as Vive is getting worn out and stained and all sorts of lovely things. And seriously... if I had something bad to say, I would... I just... haven't found a recipe i haven't loved yet! Welcome back Dreena! I've missed your posts. Well, I'm glad you're back! What a trip! Since you have been gone, I made the lemon-herb tofu, looking forward to trying it mashed as leftovers. But, what leftovers? My family hoovered it up. Next time, I'll make two packages. Also made the fudgy brownies. I think I baked them too long, they seemed a little dry. And the cannelini bean yam hummus, finally. What a nice change from regular hummus. Really, I'm looking forward to colder weather so I can start making stews again. Too hot for all that still. Welcome back Dreena. I'm glad that you had some good vacations with your family. You and your sisters (plus mom) are so cute together. I know how great family can be- (I just finished summer vacation at home and am now back at school without the fam.). I can't wait to see all your new food posts as I've been missing them greatly. Also, good luck with finishing up the next book! Saint Dreena! You must be a saint if you traveled with 2 children on a long flight. Oh my! It's unfortunate that they don't allow alternative drink choices on (especially long) flights. I love how your family wore the same colours (except you but maybe those aren't your fave colours). Families are funny that way. My siblings and I had a family portrait done one year and we all showed up wearing various shades of brown! And I'm certainly enjoying the pregnancy TLC. I am from The Netherlands (europe)and I was wondering if anyone can give me the e-mail adress of Dreena, her website doesn't seem to work, and I would like to ask her a question!! Welcome back!!! Now I am in the mood to make brownies too. And I have to agree that the airlines are going to have to do something about those of us with dairy allergies. The airlines leave much to be desired with their food and drink choices offered for those of us who do not fit their mainstrea eating habits. Last time I flew, I made sure that I ordered the veggie meal and I had the travel agent make a special note to not include strawberries with it. The meal I received had strawberries on it. I got a really strange look when I had to refuse it. The flight attendent told me to just remove the strawberries. She just didn't understand that I am highly allergic to them and anything the berries had touched was a potential for an allergic reaction. We call the airlines, explain our dietary needs and ask for either a vegan option (yet to happen!) or ask what we need to do in order to make the flight more comfortable. The are pretty accomadating, especially if you call first, get their early to have things screened, and on one ocassion, the flight attendent took our carry-on of food and tucked it away in front but still let us get what we wanted when we needed it. Dreena, I'm really happy to see you back and (even though you told me this via email), it's good to hear you and your family had a great time even though the travel was tiresome. This whole non-liquids business needs to have other options, I agree. Nevermind that, they should have dairy-free in the first place. That conversation you had was ridiculous (drink from the top, that's actually the part they skim off of cows milk, the fat rises to the top), so essentially she was telling you to drink the fat of the cows milk. Gross. They really need soy/nut/rice-milks everywhere, even in the sky. For me, I just sleep through the entire plane ride whether it is 1 hour or 10 hours, and forget the food. I really like the photos of you and your family and it makes the photo more interesting that you stick out. I am the "freaky vegan that sticks out" in the family too! In many ways. I'm glad you're back and I don't have to keep seeing those amazingly awesome looking cookies that I can't bake. I'm looking forward to what goodies you have next (not the contest per se, just the food pics). Welcome back, Dreena. I think the no-liquids bit is insane, and I'm waiting for the airlines to start screaming about profit margins (which the Repugnants will understand). I agree that there should be healthier options on planes, but I tend to order ginger ale simply because I get really queasy if there's turbulence. Welcome back! I'm glad you had a nice trip!! I just had to laugh, hearing the airplane story, because I too have run into the food on an airplane problem, among others. I was told I had to order it ahead of time (next time, I will know better! ), of course. Other times, I have been at conferences, and they have these great boxed meals but they are all salads with some sort of meat on top. If I could bear to scrape the meat off (which sometimes I can), all I have left is lettuce! That is NOT a meal, nevermind vegan. I was at the beach this week and every time we ate out there were little other options than house salads (lettuce and cucumbers) and baked potatoes (are you sure you don't want sour cream or butter on that?)! What works for me (at least here in the US) is to tell them I "can't have dairy" and at least the restaurants are very, very careful. The airlines have years to go! On the bright side, Dreena, I did make your Coconut Lime cookies again to more rave reviews! They are so light and perfect for summer! Your oat bars were another lifesaver for me on our road trips. So much healthier than storebought ones! Hooray! You're back. What a weird coincidence. I just made your Peanut Better Cookies today. I like to make them with a modified version of this spiced walnut recipe I got from the winning recipe of a cookie contest Emiril had. Add these walnuts with one teaspoon of chili oil and 1/8 tsp cayenne to the wet ingredients before incorporating the dry. It makes them very different and memorable. Glad you had a wonderful time with your family. It's too bad your other sister couldn't join you. Well, I can't wait for more food posts and pics...and ofcourse the contest. Wow welcome back, I had missed your posts (yeah even though I'm the suckiest commenter in the world..), great to see you had a lot of fun on your trip! I agree, I'm still surprised how few dairy-free options are available even in general when you look at how many people have problems with dairy allergies and such. And to echo the other posts, you have such an awesome looking family. and yeah your mom definitely doesn't look like she's in her 60's! Holy doodle Dreena! I didn't realize you were from The Rock. I grew up in Fredericton. Ever been? It's a very nice place & like it, but don't know if I could live there full-time anymore. (maybe when I retire) My mom & dad still live in F'ton and the kids have scattered (like your family). 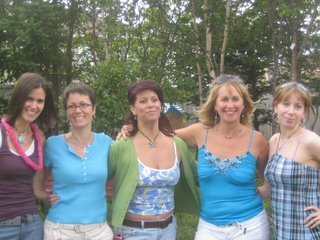 I have one sister left in Fredericton, one in Northern NB, one in BC, a brother in Halifax, a brother in Japan and me in Ontario. It's been a while since we were all home together, but when we are, what a blast. Sounds like you had a great time with your family as well. Flying has become more of a hassle than ever! I can't believe they were giving you a hard time about pre-packaged drinks. The anonymous poster had some good advice about calling ahead. I'll do that next time. I can't imagine flying for such a long time with 2 small children. I get cranky when I'm stuck on a plane for hours. Dreena, I made your orange poppy seed muffins last night, and oh-my-goodness, they are soo good! Not like a dessert muffin, but a moist, soft, melt in your mouth yumminess! I just used spelt instead of barley, and they are great! YAY!! You are back!! I hope you had a relaxing getaway and are feeling refreshed to get back into your groove. I am a teacher and have to admit I am ready to go back now. I miss all the kids!! I am in dire need of some Dreena inspiration as my cooking has been lazy and uninteresting! welcome back... nice to see and hear about your fun trip. That's HILARIOUS with the outfits! And then your colored font! you're too cute. and how sweet are you to reply to EVERYBODY! and, p.s., how hot is MOM??? Hi Crystal! omg, I don't think I'm that much of a sharp dresser, but thanks! I was talking with my sisters about how I have everything so "practical" - t's, tanks, jeans, capris (love capris), but it works for my life with the girls! Hey Megan... okay, you are a brave one going back there every year during the winter!! And yes, 4 seasons in a day is so accurate - even this trip we had days that were sunny then cold/cloudy, back to sunny, etc the whole day. It is very unique! Aww, you're too kind - my sisters will love to hear that (yeah, me too!) esp as we are all "gettin' older"! ha! Hi madeinalaska, nice to see you - welcome to this incredible world of blogging! Yay that you're lovin' Vive!!! Thanks :) pls e-mail/comment if you ever need help with anything, and I appreciate your good words! Hey Amy... woohoo to tofu!! Glad you enjoyed - er - hoovered it! Yeah, the brownies may not look fully cooked when you pull them out at around 25 minutes, but they continue to cook some while cooling, and the fudginess comes partly from not baking them too long (even the edges aren't as fudgy as the centre because of that extra baking/heat around the edge). I am looking forward to more stews too - though it hasn't been too hot here that I can actually make them now! Sweet pea, I SHOULD have been sainted after that flight, believe me!!! The 21 month old didn't nap more than 20 minutes each way, either - yikes! We did a lot of toy juggling, snack giving, talking/reading - it was totally exhausting! But, we got there and home safe and that's all that really matters. I love the story about the shades of brown! I actually love the colors of the aqua and green my family was wearing - but, I just wasn't 'with it' that day! Kourtney, that's a great tip. I would have to test my girls on the powder first, since we've never tried it before. Certainly much lighter to tote as well!!! Thanks! Hi Mia, gosh, that's tricky with the strawberry allergy. Sometimes they are even put on the side as a garnish. We used to order veggie meals, but now on our Air Canada flights, you can't order any meals at all, they just have on-flight snacks/sandwiches that are mostly junk. Too bad, I used to actually like their strict vegetarian meals! Hi anonymous... thanks for the note. We used to always preorder our meals but now the major airline in Canada - Air Canada - does not provide meals and so we cannot order the vegan meals. Believe me, we would have!! I used to enjoy them, and it meant not having to pack so much stuff. Though, if our connecting flight was missed with delays, we would sometimes lose out on our meals. But now, the only things they have on their 'menu' are baby carrots with ranch dip (ugh), apple slices with caramel dip (most likely NOT vegan), and a vegetarian sub - which I can only guess has cheese or mayo on it. I'm hoping they will change their meal service again, but then, we won't be flying again for a VERY long time anyhow - too tough doing long flights with them young. But your suggestion of calling ahead just to inform them of our dietary needs and so they give less hassle with the food - never thought of that - great idea... thanks! Hi Danielle, I know, the fizzy stuff helps a bit on planes. I go with club soda with lemon juice at times - esp if they don't have bottled water! Hiya Julie!! Thanks so much (and I think hubby's a handsome bloke too! :) You have been doing lots of cooking over the summer too it looks like!! Look forward to seeing more of your cookin' too! Hi Tina K! Thanks, that's so nice of you! I think that's adorable that you are missing teaching so much. I bet you are an amazing teacher and the kids must miss you too! Oh, and my cooking can be quite uninspired at times too - trust me! Hey Dayle!! (to all of you bloggers, this is my lil' sis - the one I mentioned, the baby blonde!) Well, now you know I was always the sweet sister, right? - okay, you're pretty close too but we won't talk about the rest of them - ha! Mom should read all these lovely comments about her - oh, and you do remember the vegetable man, right?! He always thought she was the best thing since turnip!! Let's hope we get her good skin genes. :) Talk soon.. xo! First time commentor, but a big fan of your blog/books. I DID actually fly Air Canada to Halifax last month, and they had a pretty good veggie wrap that I'm pretty sure was vegan. Grilled veggie's with hummus on a pita. It wasn't bad at all! Dreena. GET OUT!! You're kidding me! A picture of Waterloo Row?? I LIVED ON WATERLOO ROW FOR 18 YEARS!! Crap! That is just too freaky. I spent much time at the university, so maybe we did bump into each other. I also liked to walk/jog "The Green". My very first job in high school (FHS!!) was working at a health food store on Regent St. that a friend of mine owned with his mother. I made a whole whopping $3 an hour. I then worked at that convenience store on University Ave. down from the university. A lot of students came in there. Maybe you or your husband did & know the places I'm talking about. Jim had never been to Fredericton, so we went for a vacation about 3 years ago. That was the first time I'd been home in about 5 or 6 years. I noticed a lot of things were different...but a lot the same. I took him down to the farmer's market on George St. which is where I discovered Elizabeth Demerson and her amazing pottery. OK, this is just getting too rambly and way off subject. I'm just tickled that you know the places I'm mentioning. hehe! Rest up and when you're back blogging, I have a couple of posts to put up directed to you. I've been saving them for your return. I'm glad you had a great vacation! What a bummer about the plane ride though--it amazes me that you can't get dairy-free milk. How ridiculous! I'm Laura, by the way. I became a vegan while you were on vacation, and I've been peeking in ever since to see when you would return. I'm glad you're back now! I'm losing my patience with these humans drinking non-human animal secretions and acting as if it's necessary or as if vegan cheese won't do, so they just eat cow-milk cheese and it's okay because it's "only" every once and a while (especially with all of the suffering involved). Carrie, we are now in bizarro world like that Seinfeld episode! I used to take walks on Waterloo Row all the time. We lived near the campus, first on Forest Hill Road I think and then on Biggs Street (I think, it's been A WHILE now)!! We really did love our time there. I don't think I ever went in that health food store, unfortunately. Those were my "cheese" and "frozen yogurt" days. I used to get cheese potatoes at Wendy's all the time - and ice-cream at this shop... oh, I can't remember the name - when I do, I'll come back with it! :) Very funny, hey? We were there for just two years, but it was a very memorable time, and I always praise the campus there and the faculty in the Commerce program - they were incredible - and the people I met there too!! Hi Cherie!! Good to hear from you and yeah, I'm back in the blogging world!! (so sweet that you checked almost every day to see if I had a post up) :) Funny about the flight attendant - I'm not usually even as bold as THAT! I'm typically too 'nice' about things. I would love to have a sharper tongue and get a point across once in a while. Whenever I do, I then ruminate about it for far too long though! Gosh, what a sap I am!! Ah well, I'll try to convince through cooking I guess! You have a great writing style and we really appreciate the work you're doing through food activism and have nothing but good things to say about your cookbooks and recipes! My fav parts of this post was the sister's quote and the "freaky vegan" thing - that's perfect! Hi Dreena! I've been reading your blog since November (when I was turned-on to it by the Vegan Lunch Box blog) and just love it! I've been a "casual" vegetarian for 17 years (meaning on very rare occasions I ate chicken-like a few times a year) but became a vegan in February [thanks in large part to you and Jennifer (at VLB)]! I bought both of your cookbooks and have been slowly making my way through them. Your recipes are fantastic. I especially like all of your wonderful salad dressing recipes which have inspired me to experiment with some of my own. I really appreciate your Wheat-free options, also! I finally found some Hemp seed nuts at my local Health food store and made the Apple Hemp Muffins! Delish! Keep posting and I'll definitely keep reading! Thank You! Dreena, I feel your travel pain -- I recently had a long flight back from Wyoming to Minnesota, (not as much time in the air as you . . . but due to a major engine repair delay where they did NOT deplane us, I missed my connecting flight in Denver and was very fortunate to scoot on a slightly later one . . . putting me home at midnight! ), and it was the thirstiest flight of my life. Fortunately, they do have bottled and sparkling waters, and I brought tons of snacks, which helped. I applaud you for making it through in one piece with two small children! Cherie, or we can be very sharp-witted and really drive the point home! That's what *I* need to remember!! Hi Raylon... welcome aboard, and thanks for all of your compliments!! :) I visited your blog, it looks like you have some excellent vegan events and eating/shopping in Sarasota! Lucky you!! I really appreciate your good words, and if I can help your vegsarasota group in some way such as a recipe reprint for your members' mailing list, let me know! Glad to hear you had a good trip down east, Dreena! welcome back! it sounds like a lovely trip, well, minus the whole 'no vegan food on flights' thing. that always worries me when i fly (thankfully not very often), but the new 'no liquids' rule scares me even more! thank goodness they let you keep the soy milk and food you brought!! beautiful family photos -- georgous sistahs! as far the the color coordination goes -- they look oceanic & you look earthy -- perfectly complimenting eachother. Great pictures! Very nice! Sorry to hear about the flight complications with soy milk. They should REALLY have soy milk as an option even if they don't support veg*n diets...for the allegies, you know, but why not for the veg*ns? I'm with you on that. I have been sliding backwards on weekends with the vegan aspirations...but cotninue to try...the only excuse...products not available to me and I'm still learning. I really like being about to BREATHE and not eat dairy (i.e. cheese & cream) but it's in almost everything when I travel and eat out and I'm the only veg*n. Sheesh! I just really need to put my foot down! Sorry needed to vent.